Technological revolutions in many fronts of information technology create a huge and growing demand for higher density data storage device, higher data processing rate, low power consumption and low cost data storage systems. The fast and coherent switching behaviours of small magnetic nanoparticles make them to suit the demands, thus becoming the best candidate for modern high density magnetic data storage devices. Two challenges to be overcome for realizing this device concept are superparamagnetism and magneto static induced coupling of the nanoparticles. 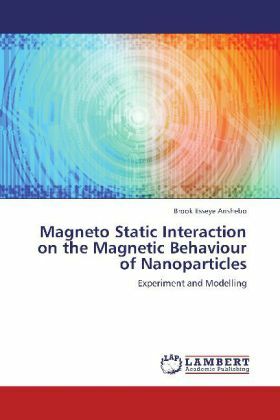 This book addresses the magneto static interactions. Influences of magneto static interactions highly depend on the lattice structures of the nanoparticles. Those nanoparticles that exhibit FCC crystal structure,for example, are highly influenced by dipolar interactions compared to particle assemblies with uniaxial anisotropy. Broadening of switching field distributions with dipolar interactions observed regardless of crystal structures. Magnetic materials with uniaxial anisotropy are suggested for high density recording media for predictable coercive field using Neel's formula.